The conviction of the “Srebrenica executioner"
Genocide was actually carried out in Srebrenica, and Ratko Mladic was directly involved in the plan to eliminate the Muslim population from the territory of Bosnia-Herzegovina. “Without him, crimes would not have been committed as it actually happened”.The International Criminal Court for the Crimes in the former Yugoslavia, based in The Hague, has thus found Ratko Mladic guilty for the genocide of Srebrenica, with the aggravating circumstance of always denying the episode and delivering false accounts of it to the media. Mladic was held guilty also for the siege of Sarajevo and acts of murder, unjustified killing of civilians, and carrying out forced deportations to the Bosnian capital, with the intent of spreading terror among the population ("Let's not let them sleep – said Mladic in 1992 with reference to the citizens of Sarajevo – let's make them go crazy"). The court also validated the charge of taking the UN blue helmets as hostages and using them as human shields in order to prevent any possible Nato intervention. It instead acquitted Mladic from one of the accusations of genocide concerning crimes perpetrated in some villages of Bosnia-Herzegovina (Prijedor, Kljuc, Sanski Most, Foca, Vlasenica and Koto Varos). The Court did thus sentence Mladic to life in jail. The verdict came after a long pause, in which Mladic first asked to be allowed to go to the toilet and then reported a fainting spell, remaining outside the courtroom to have his blood pressure checked and demanding the suspension of the reading of the verdict. When the judges' decision to go on with the hearing was announced, Mladic re-entered the room shouting against Court, which then ordered him out of the hall. Thus comes the eagerly awaited first degree verdict – after a trial that had started on 6 May 2012 , in which over 300 witnesses have been heard and more than 10,000 pieces of evidence have been analysed - against the “Srebrenica executioner” who led the genocide of 11 July 1995, in which over 8,000 Muslim men and boys were murdered, and the siege of Sarajevo, that lasted for 44 months and claimed the lives of over 12,000 people. The verdict against Mladic, who listened to the courts' decision wearing a Natalie's Ramonda flower, the typical Serbian symbol of First World War, and shaking his head as every charge was read out, follows the one handed down on 24 March 2016 against Radovan Karadzic, sentenced to 40 years in jail for crimes connected to those of Mladic'. In particular, the charges read out, the acts of Karadzic and Mladic were aimed at the extermination of the Croatian and Muslim population, with the purpose of removing those ethnic groups from Bosnia-Herzegovina. “The ethnic cleansing was not the consequence of war, but rather its goal”, reassessed prosecutor Alain Tieger during his final speech against Mladic. According to the court that handed down the verdict, Karadzic in 1995 ordered the Serbian army to create “impossible hardship for civilians”, and Mladic “turned this order into reality”, with the direct aim at eliminating the Muslim population from the Bosnian territory. Karadzic was the founder and president of the Serbian Democratic Party (Srpska Demokratska Stranka, SDS) of the Socialist Republic of Bosnia-Herzegovina. On 13 May 1992 – after the majority Muslim government of the capital, Sarayevo, had voted for the exit from the Yugoslavian Federation – became the first President of the Serb-Bosnian administration, also taking up the power of commanding the army. He was, therefore, the highest civil and military authority of the Republika Srpska. 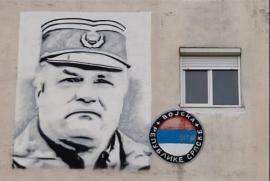 Mladic was instead the commander of the Second District of the Yugoslavian army, which then would become the Serb-Bosnian army. Since 14 May 1992 he took up the role as commander of such army and consistently acquired the power to control all military issues. According to Karadzic, independence was “a highway to hell and suffering” and Mladic “a key character in this route towards hell". Both were charged with 11 counts, not only concerning Srebrenica and Sarajevo, but also the ethnic cleansing of the villages of Bosnia-Herzegovina. Indicted as early as in 1995, Karadzic was arrested on 21 July 2008, while Mladic only on 26 May 2011, after 16 years of life as a fugitive. Like Radovan Karadzic before him, Mladic has shown the world what a war criminal is like. He never showed repentance for his deeds, never had a moment of commotion in front of the Mothers of Srebrenica or the relatives of his victims. He has always followed the contemptuous logics of the military, who says he merely executed orders and “defended his people”. Not only that. On the day when the trial against him opened, he threatened a Muslim woman by mimicking with his hand the act of cutting her throat. In this attitude, it seems to see again Nazi criminals such as Eichmann or Priebke. None of them has ever had the courage and strength to take up responsibility for the horrors perpetrated. They all chose denial. If, on the one hand, the Mladic verdict somehow put an end to the Balkan wars, it is also true that the memory of this trial will not be beneficial only to Bosnia. Mladic puts us in front of an evil that seemed to be confined to schoolbooks only, reminding us that that kind of evil is absolutely real and dangerously close to us. These events related to him do not only enable us to ask ourselves many questions about those crimes, but also to show the younger generations the portrait of a villain: not a caricature, but an individual who opted for evil, for whom the act of murdering was a result of a cynical political calculation.